Every year, we come up with a few funny Halloween costume ideas, and this one may just be my favorite! 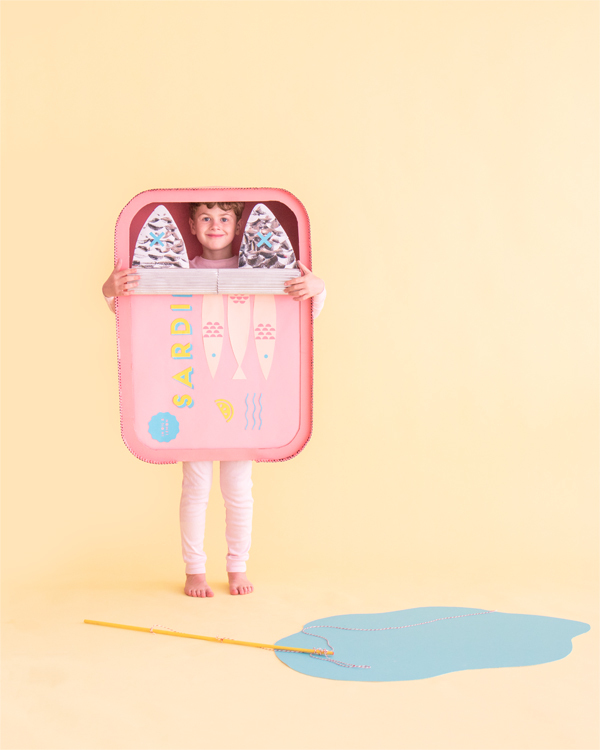 After all, a can of sardines is a perfectly natural costume choice (we know, we’re weird… but it’s cute, okay?!). 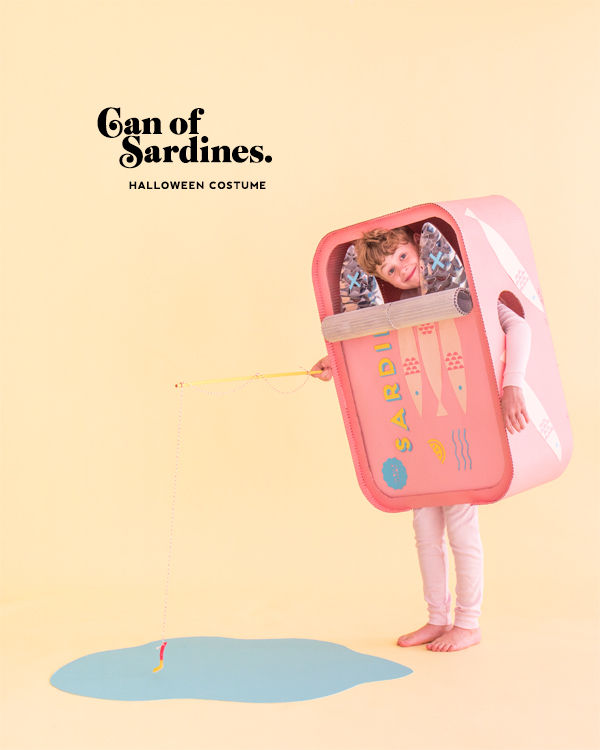 We love the beautifully designed sardines cans that come from Europe, and we figured we should pay tribute to them with this silly costume. The best bit is the metallic sardines peeking out from the can! 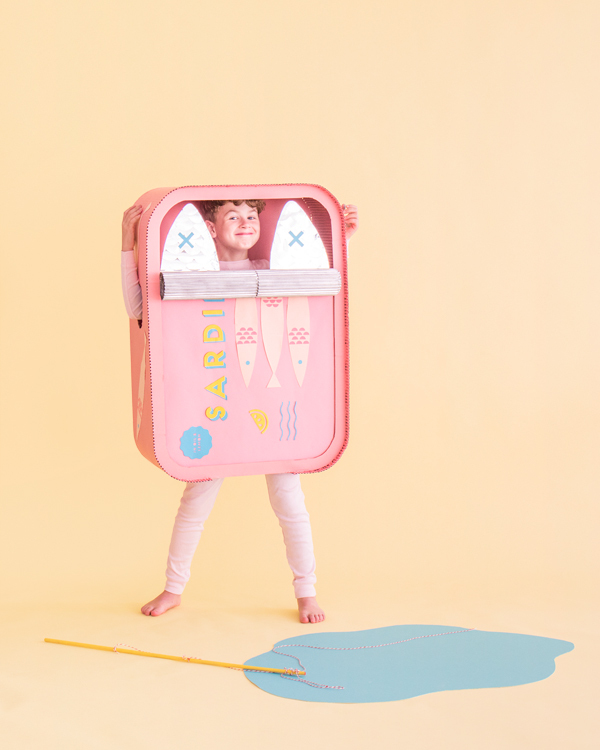 Read on to make this costume for yourself! Step 1: Draw and cut a large rectangle that extends from the wearer’s mid-thigh to 5” above the wearer’s head. Round the corners then trace the shape onto another piece of cardboard and cut out. Step 2: Cut out a window following the outline of one of the rectangles, leaving a 1 ½” border. This will be the front of the sardine can. Step 3: Cut a piece of corrugated paper long enough to fit around the perimeter of the sardine can shape. Leave the bottom center of the can open for the wearer’s body. Extend the corrugated paper 1” above the front of the sardine can and hot glue to secure along the outer edge. Then, hot glue the back of the sardine can to the other side of the corrugated paper. Cut holes for arms on both sides. Step 4: Spray paint the sardine can base white and let it dry completely, then spray paint it pink. Step 5: To make the rolled front of the can, measure and cut two strips of corrugated paper to the width and height of the can. Trim 1” off the sides of the top third of the corrugated paper. Roll the paper down so the corrugated side is showing, stopping where the 1” indents end. There should be enough open space to allow the wearer’s head to show, once the piece is rolled. Hot glue to secure then spray paint the rolled section silver and the rest pink. Step 6: Hot glue the front of the sardine can to the inside of the can. The rolled portion should stick out of the can. Step 7: Cut out cardstock decorations to add to the front and sides of the can like sardines, letters, and other embellishments, then glue to the can. Step 8: Cut a sardine shape out of cardboard. 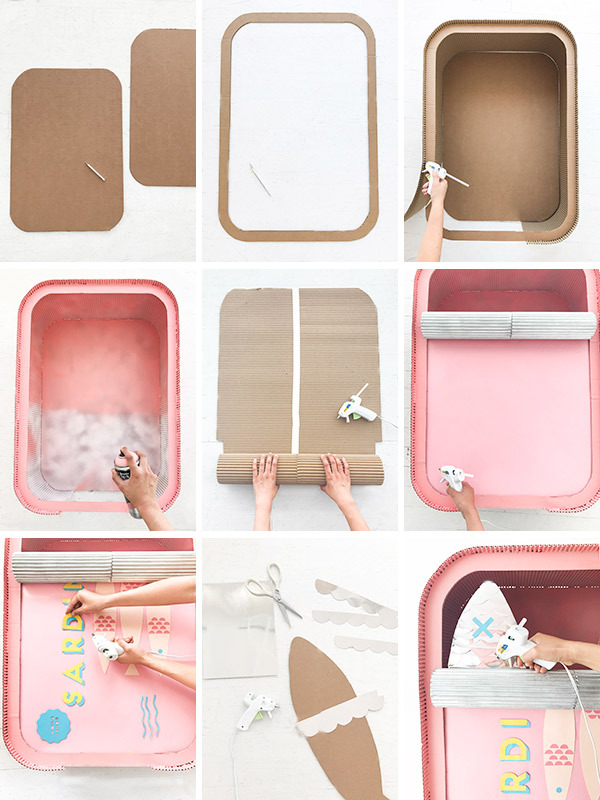 Trace the shape onto another piece of cardboard and cut out. For fish scales, cut large scallop patterns out of mirrorboard and affix to the cutout with hot glue. Trim off the excess. Glue the mirrorboard sardines to the inside of the front of the can, leaving space in between the sardines for the wearer’s head. For eyes, cut x-shapes out of cardstock and glue to the face. Step 9: Cut two pieces of nylon webbing for straps and glue to the interior of the costume. You’re ready to party! Oh my gosh. That is so adorable!! I love this so much! 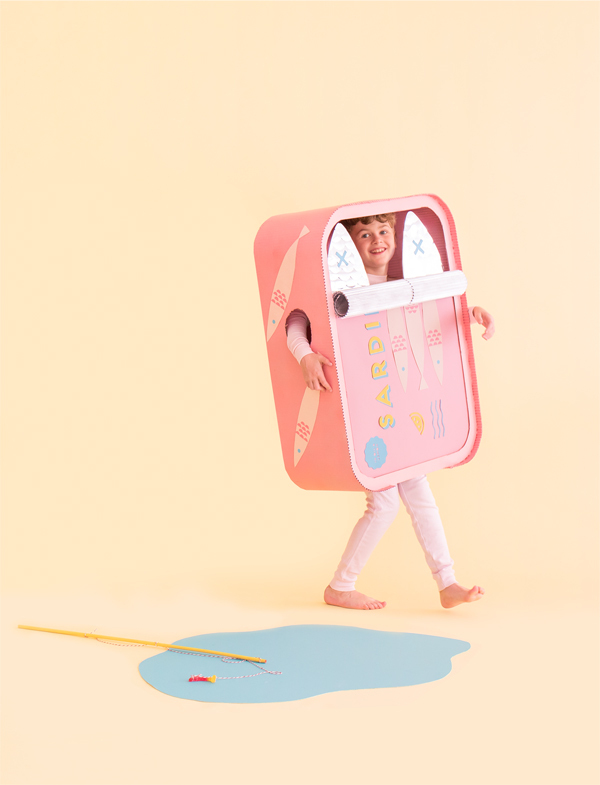 As someone who has always wqnted to dress as a toaster for Halloween, I think this is fantastic! Omg! It looks so CUTE! I love that Halloween isn’t just about scary outfits here! These costumes are getting better and better (funnier and funnier too)! THIS IS SO HILARIOUS! I love the colours too.. reminds me of the anchovies i just opened last night for caesar salad dressing… 😛 I’ve never seen mirror board before but I now need to find some!